Is Gina cooking a mini-Gina in there? My vet also recommended that Gina receive Regu-Mate to support her pregnancy. Regu-Mate is a synthetic progestagen which is most often used to suppress estrus; however, it’s sometimes recommended to help mares with low progesterone levels maintain pregnancies. (My vet recommended it due to Gina’s embryo absorption last year.) 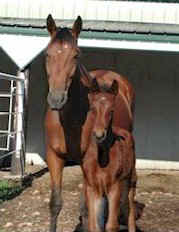 If you’re interested, Equine Reproduction has a thoughtful article on the subject. Like last year, my vet recommended that Gina continue her usual diet and exercise regime. She advised that I’d probably want to stop riding her around month eight of pregnancy, but until then, it’s in Gina’s best interests to stay in good shape. I’m sure all the lesson students she regularly terrorizes are thrilled. I’m just as excited about this cross as I was last year. 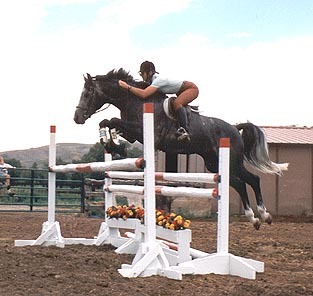 I’ll even grudgingly accept a gray colt if it jumps like its sire! yayay!!! my fingers and toes and everything crossable are crossed that she hangs on to that little baby embryo!! All the bay fillies for you!!! Preferably only one at a time though Gina! 🙂 YAY! congrats and fingers crossed. I’d want a gray myself, but I’d regret that when they got older. I would regret not having all the brown hair to disguise the dirt, haha! Is the injectable still regumate? I’m going to have to ask about that for Annie. It’s the same thing, but the concentration doesn’t end up getting distributed as evenly. With the oral version the mare is getting a certain amount per day, every day. Very steady, easily controlled hormone levels. With the injectable, she gets a spike when the shot is first administered, then less and less is in her system as the duration between injections pass. So usually for pregnant mares that are “high risk”, the safest bet is giving it orally since it’s more consistent day to day. From what I’ve been told by Repro specialist vets, the injectable seems more common for use in showing mares that need hormone therapy. It works well for some, but not as well for others. So might be worth trying for Annie? Yay Gina!!!! Fingers crossed she keeps that baby cooking until it’s ready to come out! Whoop! I’m so excited, though also bummed that I apparently won’t be getting your fancy great pony. Yay! Fingers crossed for you and Gina! Oh! I didn’t realize it is manhattan that she is bred to! He is one of my favorite stallions. Another blog I follow just bought a manhattan baby too! Whooooo!!! I’m so happy for you! Yay!!! So exciting! Crossing all the crossables that she holds on to this one.